Beacon is small, inexpensive wireless device that broadcasts signals using Bluetooth Low Energy BLE or Bluetooth SMART technology. Mobile apps on compatible devices are able to listen for signals from beacons on proximity area and then trigger an experience such as sending a promotional notification, coupon, video, URL form, and others via the app. In addition, beacon technology is widely being adopted in various sectors such as retail, healthcare, travel & tourism, and education owing to its benefits such high degree of accuracy as compared to other geo-location technology, low impact on the device battery life, no internet connection required as it communicates through Bluetooth and others. 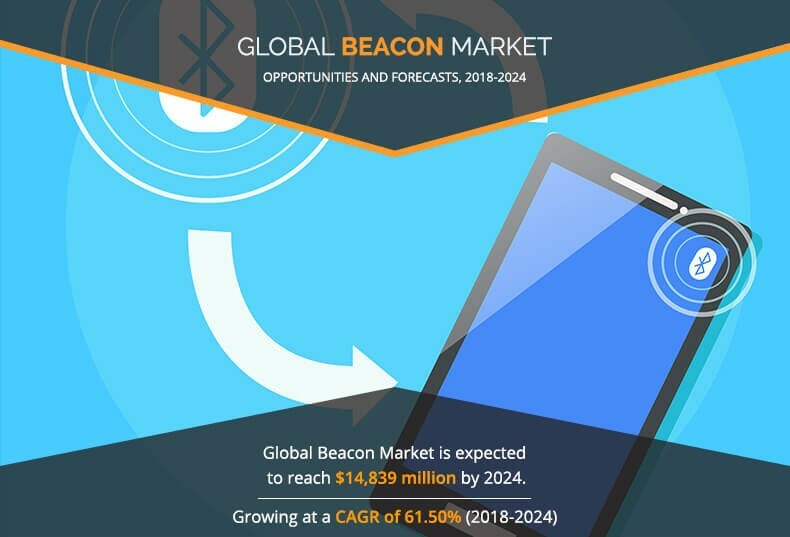 The global beacon market is expected to register significant growth in the near future, attributed to increase in investment in proximity marketing globally. Further, employee & asset monitoring, safety & security, resource optimization, and other features of ktion fuel the market growth. However, rise in data security and privacy concern is expected to limit the beacon market size. Moreover, upsurge in organized retail provides ample of growth opportunity. Advanced system, SLU., Apple Inc., BlueCats, Blue Sense Networks, Estimote, Inc., Gelo, Glimworm Beacons, Gimbal, Kontakt.io, and Beaconinside GmbH are some of the key players operating in the global beacon industry. The global beacon market is segmented based on type, technology, application, and region. Based on type, the market is divided into iBeacon, Eddystone, AltBeacon, and others. Based on technology, the market is classified into Bluetooth Low Energy (BLE)), Wi-Fi, Ultrasound, and Combined Technology. Based on application, the market is segmented into retail, travel tourism & hospitality, healthcare, BFSI, and others. 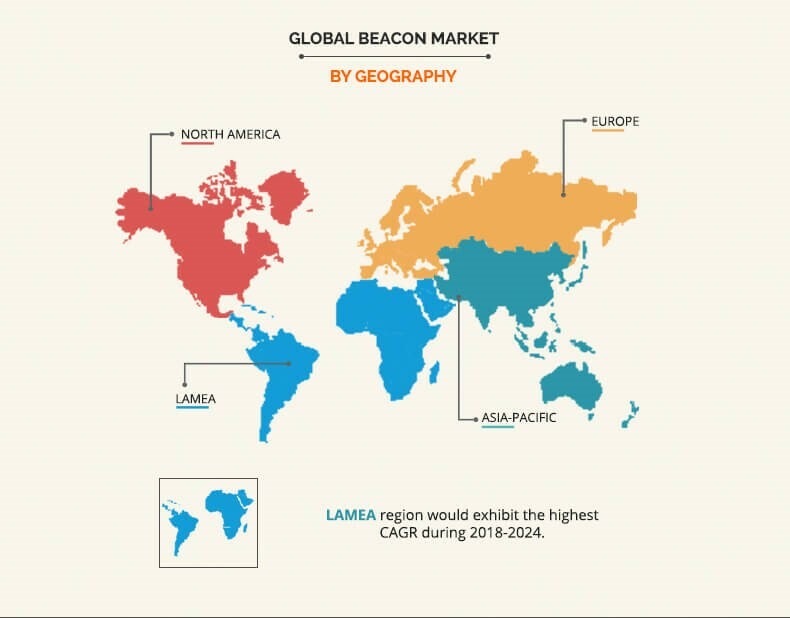 Based on region, the beacon industry is analyzed across North America, Europe, Asia-Pacific, and LAMEA. 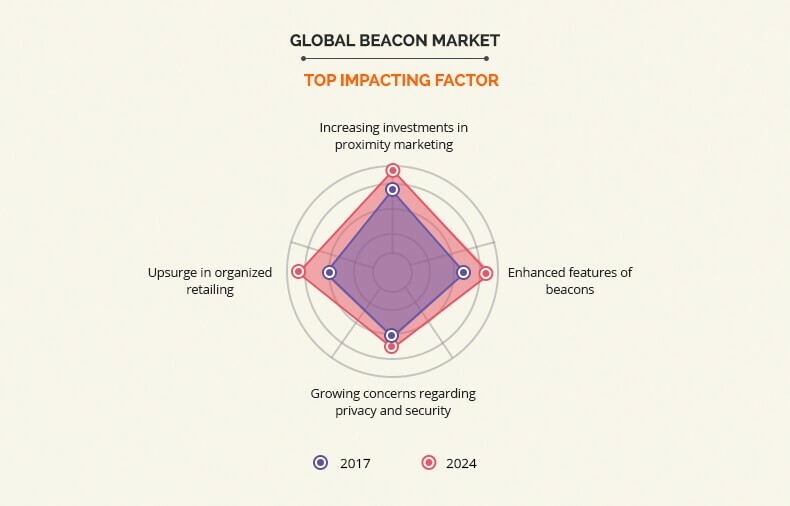 Increase in investment on proximity marketing, enhanced features of beacons, growth in concern regarding privacy and security, and upsurge in organized retail are the significant factors that impact the growth of the global beacon market. These factors are anticipated to either drive or hamper the beacon industry growth. Proximity marketing target potential customer with personalized advertisements based on the customer location to attract the customer for purchase. Over the recent years, proximity marketing witnesses an augmented investment due to several factors such as high possibility of conversion of successful sales, improved customer relationship, enhanced personalized experience, real-time and inexpensive nature as compared to traditional marketing. Moreover, increase in mobile penetration fuels the growth of proximity marketing as consumer buying habits has undergone a drastic change in recent years. More than 80% of smartphone users use their smartphone for searching information about the product and thus decide for the purchase. Therefore, increase in popularity of proximity marketing is projected to drive the growth of the beacon market as it is the simplest way to connect to customer. Further, beacon doesn’t require internet connection to connect customer smartphone; mobile app can pick up beacon signals without an internet connection and store data locally on the device. Beacon technology has transformed the traditional marketing process through proximity marketing where it targets potential customer with personalized advertisements based on the customer location. Further, its features such as employee & asset monitoring, data generation, resource optimization, and others boost the adoption of beacon solution among several industry verticals. However, data security concern related to data access from Bluetooth networks and Internet of Things (IoT) hinder the market growth. Furthermore, the increase in threat of cybercriminals targeting organizations via IoT devices is expected to limit the beacon market size in the coming years. Increase in disposable income, improved living standard, rise of consumerism, technological impact, and entry of foreign retailers fuel the growth of organized retail industry. Furthermore, with rise in organized retail such as supermarkets, departmental stores, hypermarkets, and discounters, the demand for beacon technology is expected to rise, as beacon makes organized retail stores smarter. When a customer enters into proximity of the beacon fixed in retail stores with smartphones, it emits radio signals to locate the customer and update the information with the associated retail app. Furthermore, based on location and movement of the customer inside the store or nearby, the retailer can send targeted messages such as offer & discounts on products, available brands on customer choice, new arrivals based on previous purchasing history, and others. Thus, easier access to the products makes the shopping experience more enjoyable. Hence, the development of the organized retail industry is expected to provide ample of growth opportunity to beacon market. This report studies the global beacon market with current trends and future estimations to portray the imminent investment pockets. The overall market potential is determined to understand the profitable trends to gain a strong foothold. The report presents information related to key drivers, restraints, and opportunities with a detailed impact analysis of beacon market. The current market is quantitatively analyzed from 2017 to 2024 to highlight the financial competency of the beacon market. North America held the majority of the beacon market share in 2017. 3.5.2.1. Growing concerns regarding privacy and security. Beacon is small device that sends out radio signals to nearby mobile phones and tablets, containing a small amount of data. Mobile apps on compatible devices are able to listen for signals from beacons on proximity area and then trigger an experience such as sending a promotional notification, coupon, video, URL form, and others through the app. Increase in investment in proximity marketing globally. Further, employee & asset monitoring, safety & security, resource optimization, and other features of beacon solution fuel the market growth. However, rise in data security and privacy concern is expected to limit the market growth. Conversely, upsurge in organized retail provides ample of growth opportunity. By type, ibeacon was the dominant segment in 2017, and is anticipated to continue this trend during the forecast period. In addition, by application, retail industry led the market in 2017. By technology, the BLE segment is anticipated to witness the highest growth rate during the forecast period. Among the analyzed geographical regions, North America account for the highest revenue in the global market throughout the forecast period. However, Asia-Pacific is expected to grow at a higher growth rate, attributed to increase in investment in proximity marketing globally. 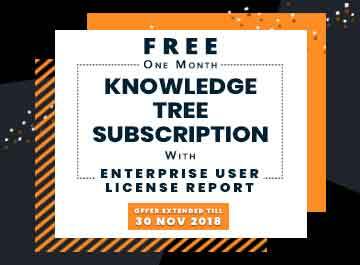 Advanced system, SLU., Apple Inc., BlueCats, Blue Sense Networks, Estimote, Inc., Gelo, Glimworm Beacons, Gimbal, Kontakt.io, and Beaconinside GmbH are key players that occupy a significant revenue share in the market.